There are more than 500 different things that can cause your dog to be itchy. If your dog is scratching all the time it is important to find out what is causing the itch. This can be quite difficult. 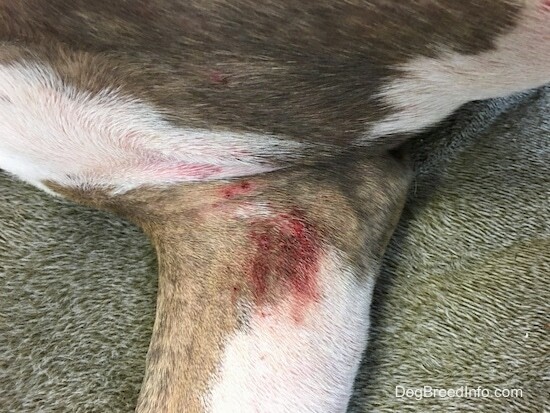 While there are many common causes of canine scratching, it can take quite a bit of detective work to figure out the culprit. Try not to scratch your dog’s itchy spot for him. Believe it or not, scratching the itch will only make the dog more itchy. One cause of an itchy dog that people rarely think of is the carpets. Some carpets have paddings that contain fiberglass which can be an irritant for a dog who spends a lot of time laying down on the floor. It gathers and becomes part of the carpet. Also the tiny microscopic bits of fiberglass that escape from behind the walls out of areas such as light sockets, electrical outlets, HVAC vents, attics, basements and even the gable venting from the attic to the outside yard. Talc powder, such as jock itch spray will often temporarily relieve the itch, blocking the tiny glass particles from entering the skin, but the only cure is to remove the dog from the contaminated environment. There are several things you can do to ease your dog’s itch while you try to figure out, with the help of your vet, what is causing the irritating itch. Bathe the dog in cool water. Warm or hot water will only make the itch worse. Soak for five to ten minutes. Adding some Epsom salts, baking soda, or colloidal oatmeal (like Aveeno) to the water will increase the soothing effects. This will provide only a temporary relief lasting from a few hours to a few days. After the bath, pat the dog with a towel. Do not rub the skin, as this will only increase the dog's itch. Do not use a hair dryer on a heat setting. A cool (no-heat) setting would be okay. Heat and rubbing the dog’s skin will increase your dog’s itch, making the bath ineffective. Fatty acids, found in either marine oils or evening primrose oil, can be very effective in easing an itch. You can try giving one of these fatty acid supplements. It will take several weeks before the benefit will take effect, so they are for treating long-term problems rather than an on-off irritation. You can find these at your local health food store. Antihistamines can sometimes be effective for short-term itches. For example, insect bites or a flare-up of hay fever. You can use an over-the-counter antihistamine such as clemastine (Tavist), chlorpheniramine (Chlor-Trimeton) or diphenhydramine (Benadryl). Be sure to consult your veterinarian first. Your vet will give you the proper dosage and tell you if this will be a good thing to try for your dog’s problem. Proper diet, be sure your dog is on a good quality dog food. Even some of the expensive dog foods being sold exclusively at the vet's office contain things a dog was not meant to eat, along with low grade meat and animal body parts. A poor diet can cause a dog's coat to smell bad, shed more than normal, be itchy, and/or have a dull texture with other possible health issues. Whole-body illnesses, such as liver disease, immune-system problems andsome cancers. 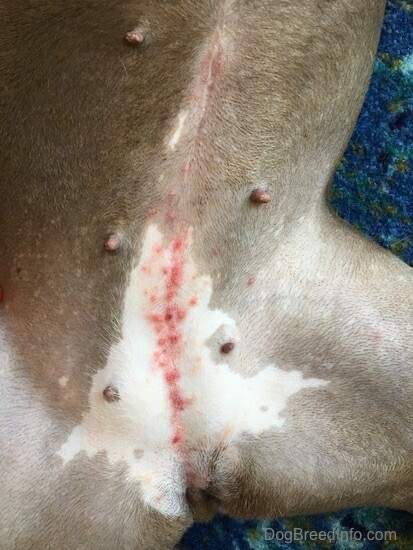 This is a rash on a dog that was caused by a rug with a padding that contained fiberglass. There were scabs all over her body from rolling around on the carpet. A dog with a rash caused by fiberglass.